Architecture used to be all about height as buildings competed for the position of the tallest skyscraper. Now, however, there is a new trend on the rise: designs are appearing underwater instead of merely above ground. This is a trend that has hit restaurants, hotels and even firms. The attraction lies in the novelty of in the sub-aquatic world. The new underwater attractions would mean that guests can now catch a rare glimpse of underwater scenery in the comforts of indoors. One example of underwater architecture that has gained fame is the InterContinental Shanghai Wonderland hotel, with part of the building extending up to 290 feet down into a lake. 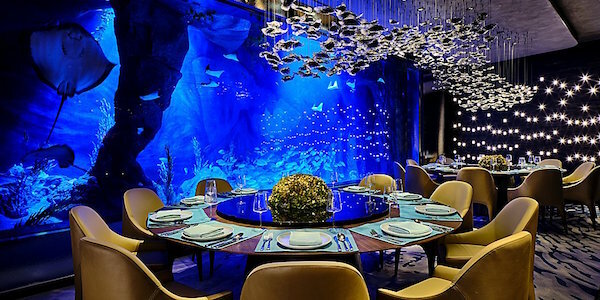 There is also Ithaa, the world’s first underwater restaurant, and the The Muraka, an underwater suite, both located in Conrad Maldives. Recently, an architectural firm, Snøhetta in Norway, also constructed an underwater dining room that can accommodate up to 40 people. With the fierce competition of space above ground, the expansion of construction plans into the underwater also helps to alleviate overcrowding. Perhaps your future house will also be one that is submerged underwater.